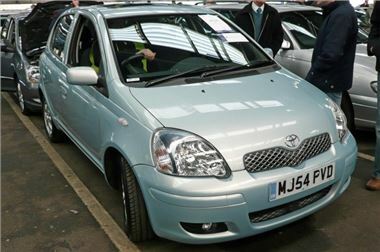 Superstition didn’t seem to be keeping buyers away and this spotless 33k mile, but four and a half year old, Yaris 1.3 T-Spirit auto made a massive £5,600. Huge money, but find another really good small torque converter auto (and I don’t include Polos). In contrast an 05 MINI Cooper convertible could not have been much cheaper at £5,500, though its 108k miles might have had something to do with it. Plenty of current shape Passat diesels to choose from today, probably all from the same company fleet. I wonder what they replaced them with? Here’s the list. As usual, ‘s’ means sold. ‘p’ means top provisional bid, ‘pc’ means provisional, but close. ‘n/s’ means not sold. ‘n/w’ means miles not warranted. ‘MNW’ means unknown mileage. ‘dmg’ means damaged. D/R means damaged and repaired. ‘fl’ means facelift. Extras like ‘lthr’ and ‘sat’ are specified when they are not standard. Lloyds TSB Live Online, Fleet and Finance, Motability, Lex Live Online, Charters p/x, BT Fleet Live Online, Vauxhall Leasing Live Online, Masterlease Live Online, Hitachi Capital Live Online, Leaseplan Live Online, Volkswagen Financial Services, Multi-source, Inchcape p/x Live Online, Eden Group, Private Sure Sell. Fleet Direct, Motability, Lex Live Online, Lex Prestige Live Online, Porsche p/x, Mercedes Benz Retail p/x, TOP CAR, Inchcape no reserve p/x Live Online, Ridgeway Group p/x, Pendragon p/x, Colbornes Group, Multi Source, Franchised dealer p/x. Lloyds TSB Live Online, Masterlease Live Online, Motability, Fleet and Finance, Charters p/x, ALD Automotive, Lex Live Online, Hitachi Capital Live Online, Leaseplan Live Online, Volkswagen Financial Services, Multi-source, Inchcape p/x Live Online, Eden Group, Private Sure Sell. BCA Peterborough stages Motorbike sales on the last Friday of each month, with high volume Super Sales featuring ‘bikes from Black Horse every two months. (Next Super Sale on 25th February). Sales start at 1pm and all are welcome to attend. There is secure motorcycle parking on the day and an expert and enthusiastic Sales Team on hand to answer questions. Viewing is on the morning of the sale and BCA can arrange transport to anywhere in the UK.